The sun was shining, it was a balmy 11°C and I was sitting on the backseat of a car, heading away from the coast. The conversation was about dragons, demons, and nuts, and I was full of anticipation for the first outdoor rock climbing session of 2013. We took a left and were on forest road, passing fields and hay barns, until Minna parked the car and declared “We’re here.” All four of us got out, grabbed our backpacks from the trunk and headed along towards the crag. It was the first time I was at Falkin Kallio in Ylistaro, and I immediately liked it: A nice short approach, and great routes for every taste. 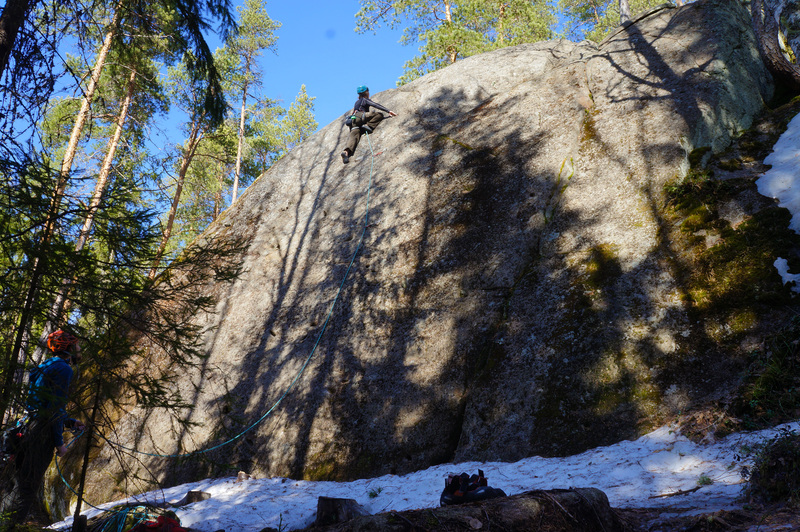 We put our harnesses and helmets on and then Mikko was off on a bolted route. Once up, he installed a top rope for Minna and me, while he and Outi practiced a few things further on the left. Minna let me go first, and so I got my climbing shoes on, made my Figure 8 Knot, and got up on the rock. Yes, it was dry. But it also was cold. 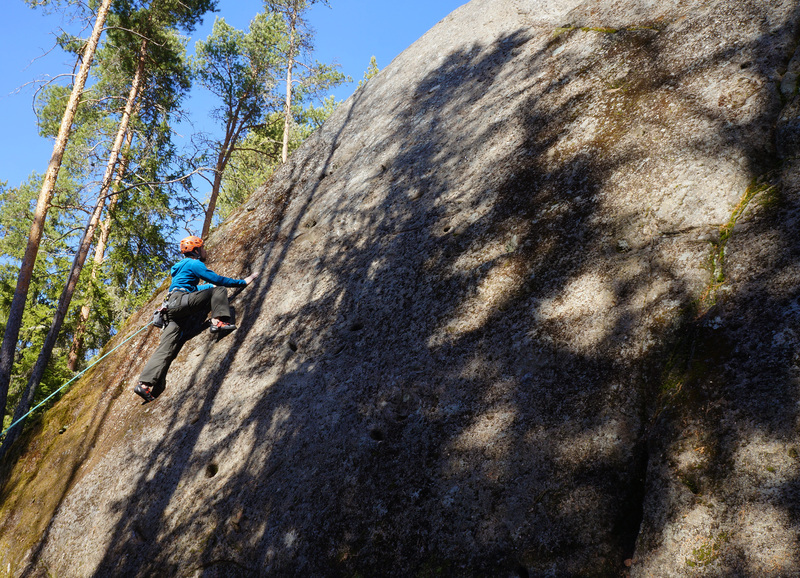 And there were no big jugs as easy holds like at the gym - small cracks, tiny crimps, and some slippery moss here instead. I slowly made my way up, remembering what I have learned in the past. I also wasn’t afraid to fail, because only when you fail, you get better. On the final few meters I burst out laughing: As I moved my foot over a ledge to get up the final few meters my leg started to shake rapidly. “Elvis has entered the building” Mikko laughed after I told them. I took a small break, relaxed my arms, and then made the move without problems. The scariest part of any climb with a new person is for me the being let down part. “Will they be able to hold me? How do I get over the ledge?” are the thoughts going through my head. I know I shouldn’t hold on to the rope, but it’s a reflex with each first abseil with a new person. But Minna let me down safe and comfortable, and I thanked her. Her turn, my belay. We each climbed the route a couple of times, and then all four of us sat down for some coffee and snacks. 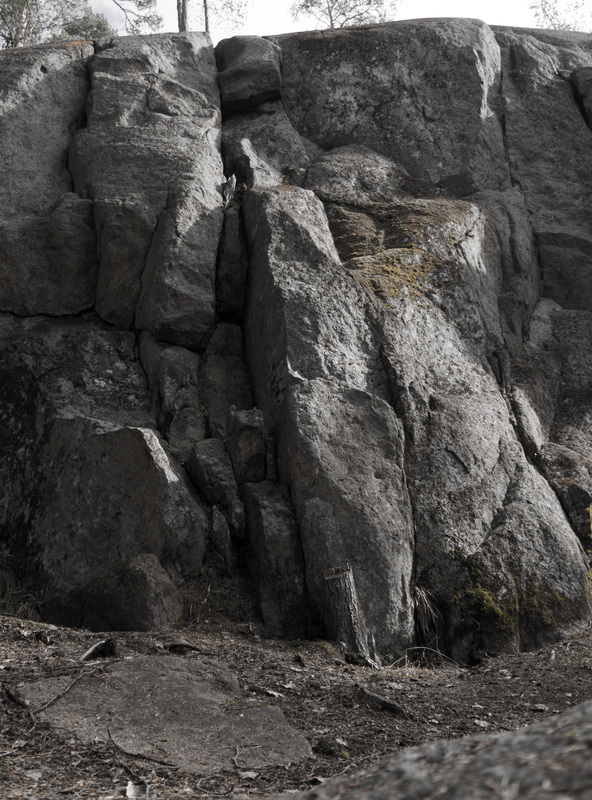 More talks about cams and nuts, climbing destinations near and far, future climbing trips. Then we geared up, and tried a new route - a small crack running top to bottom. At the bottom water was running out of a crack, and I duly slipped. 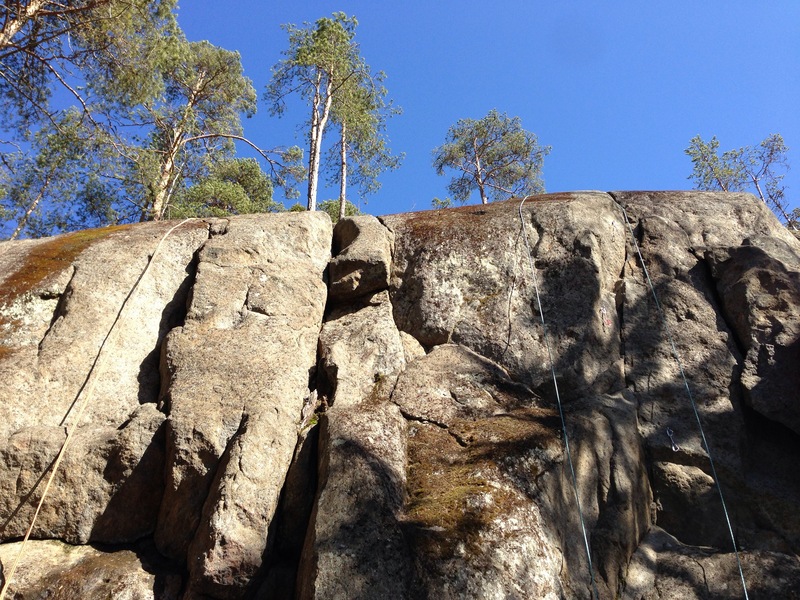 Minna caught me, and suggested I try the dry rock on the right. Much better. Crack climbing is utterly new to me, and it was immense fun. Fun now, that I think about it, but back there I was wondering how to get further up. Fingers jammed into cracks where I wondered what will happen to them if I now fall. I was halfway in a hard move as Minna informed me that the rope is stuck. Exquisite. It’s the stuff you want to hear when your fingers are jammed in a crack and you’re trying to work out how to get further up. I looked up, and saw that the rope was twisted. “Hold me” I told Minna, as I was untwisting the rope by crawling underneath it and stepping back over it. “How is it now?” I inquired. “Still stuck” came the reply. Just as well. “I will go a bit further and see what’s the problem” I let her know, and after a bit of fresh chalk on my fingers I jammed my fingers back in that crack and pushed myself up. “Stuck in a crack” I called down - “Now is good again” came the reply. I finished the climb, sat down in my harness, hands by my side, while Minna expertly let me down. 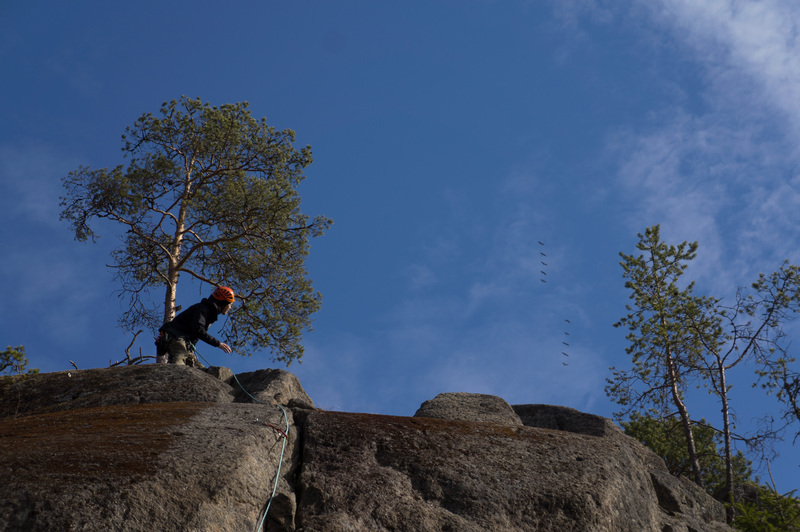 After Minna did the crack route we headed a bit further along to a slab with a couple of bolts to practice lead climbing. With snow still at the bottom and plenty of moss on the rock it looked a bit sketchy, but it was nice and easy. Well-sized pockets made for good holds, and for me it was a great first experience at lead climbing. 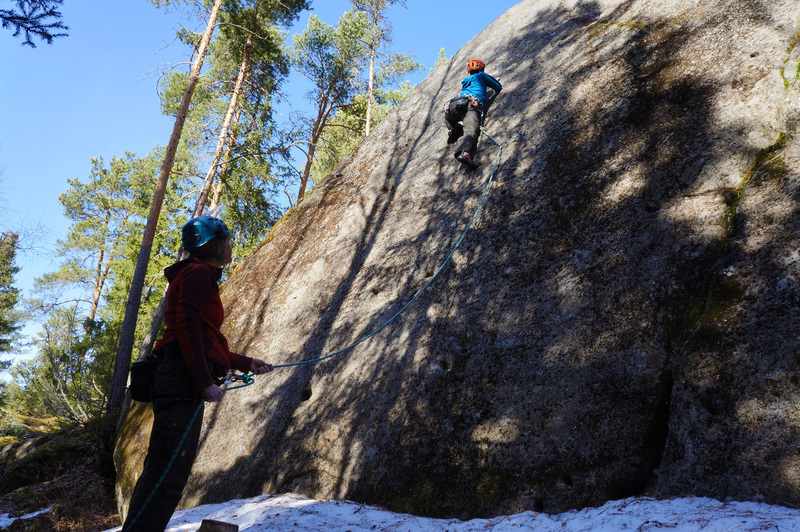 The kind of thing were you can get a taste for it, build up the skills and confidence, so that when the harder routes are to be lead you can look back and think “Yeah, I can do this. 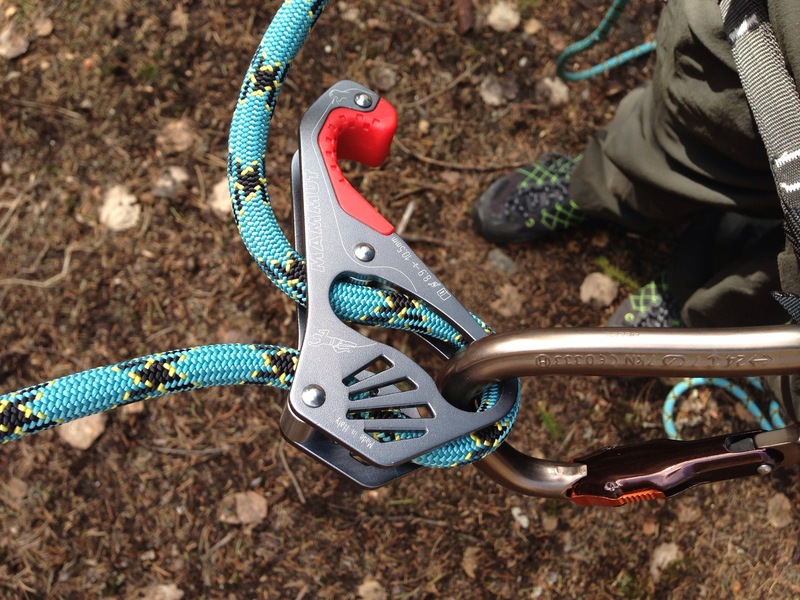 And failing isn’t a problem, either.” We each lead the two different routes, before it was again coiling up the rope, getting into my approach shoes, packing up and heading back to the car.